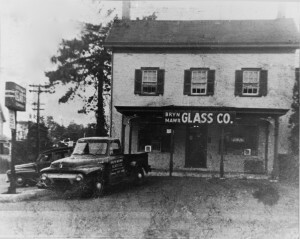 Bryn Mawr Glass was established in 1947 by Lou Pace, making us one of the oldest specialty glass shops in the Delaware Valley. For over 65 years, we've been the area's expert glass company sharing our knowledge and experience with our customers. Although our showroom did move from Bryn Mawr to Havertown, we're still the same neighborhood glass shop looking to give our customers the best service possible. We go out of our way to meet the needs of every customer and strive to operate with integrity every day. That being said, our team of glass specialists will work with you to provide the best repair, replacement, or installation possible for your project. We offer free estimates, find cost conscious solutions for your problems, and we're on time for our appointments. At Bryn Mawr Glass, we provide service with a "no pressure" attitude. Because we stand behind our work, many of our glass products come with a lifetime guarantee. Our showroom contains the latest styles in specialty glass design and a wide variety of products including shower enclosures, windows, doors, table tops, mirrors, and more. Whether you need a single sheet of glass or are looking to cover an entire room with mirrors, we treat every project with the utmost importance. We work everyday to maintain the reputation we've earned in our over 65 years of operation, and our staff truly appreciates your business. For more information about all we have to offer, visit our services page or contact us today! You can even visit our reviews page to let us know what you thought of our service. Learn more about our Glass & Surface Protector and Cleaner products.